We have been on five cruises on the “Marco Polo” and hope to go on more. One of the reasons we like the ship is that she is traditional looking, rather than like some other cruise liners that can be ugly floating hotels. She always looks good moored at the various ports we have visited. On our last cruise we went to David Bray’s Nautical Nostalgia talks, and saw a painting of his of the “Marco Polo” at Tilbury. We really liked the style and attention to detail, and decided to buy it as a memento of our trips. 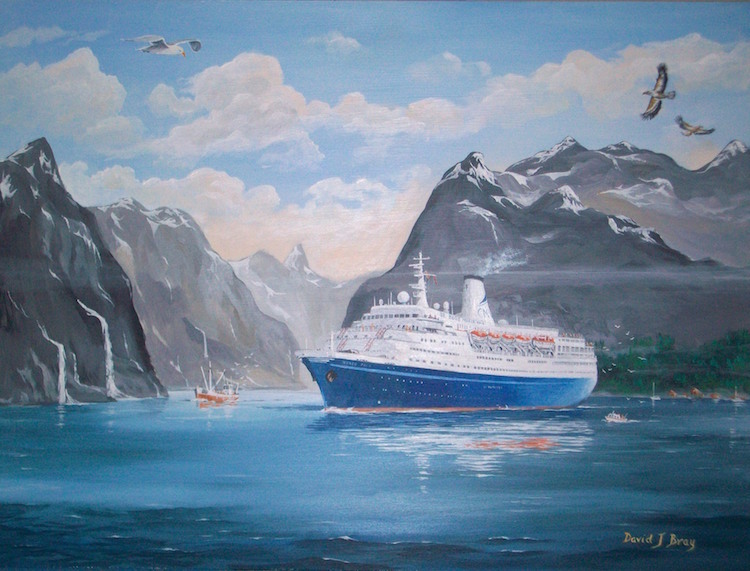 However, when we got chatting to David and learnt that he did commissions, we asked him to paint the ship in Norway, as it is one of our favourite travel destinations. We suggested the Lofoten Islands but left the details to David rather than imposing our own ideas on the picture. When David emailed to say that he had completed the painting and had placed it at the Trollfjord, I replied to say that we had enjoyed trips along there to see the sea eagles. When the painting was delivered we found that he had added a couple of sea eagles as a result of my reply! This has made the picture even more personal to us. We do not usually buy much in the way of souvenirs, but this one was well worth it and will bring back happy holiday memories for many years to come.